Pet sitter,dog walker or home boarding needed? Are you going away on holiday or business but need your pet to be lovingly cared for while you are away? Or, due to age, ill health or just a busy lifestyle, do you find it hard to give your dog the regular walk it needs? Or are you looking for an alternative to kennels and would like your four legged family friend to stay in a homely environment whilst you are away for the day,taking a much needed short break or holiday or visiting the areas many attractions and need a dog free day? Or do you own a kennel or cattery and longing for that much needed break? If so, in all cases, Paws A While With Me can help you. I am based in the beautiful Forest of Dean and can offer you a reliable, personal and professional dog walking, pet sitting and home boarding services so that you can feel reassured and can enjoy complete peace of mind whilst you are away. My service is also ideal to cover planned hospital admissions and emergency situations - it is possible to arrange care for your pet at short notice or if fully booked able to recommend local pet services. 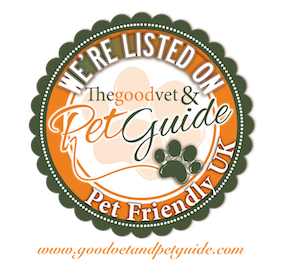 I am also insured in providing you with a pet taxi to and from the vets,local venues,groomers or a collect and deliver service(location dependent) for home or day boarding your dog for a small additional charge. Packages can be tailored to your individual needs - please get in contact for a quotation. I will ensure that your pet is safe, secure and happy by giving them the love, care and attention as though you were there. Our initial meeting will be free within the Forest of Dean area so I can meet you and your pets to discuss your particular needs. Licensed by Forest of Dean Council for Home Boarding for up to 4 dogs.